Miley Cyrus stole the spotlight at the premiere of ‘Isn’t It Romantic’ on Monday (February 11) in Los Angeles, California. 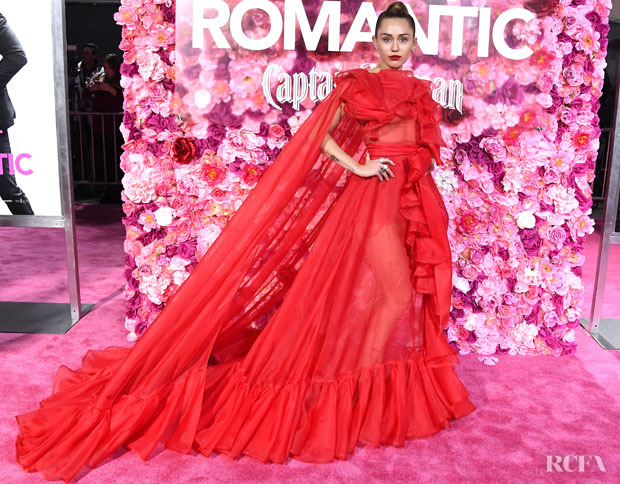 Stepping in for husband Liam Hemsworth – who was hospitalized this weekend – the singer wore an exquisite Valentino red Pre-Fall 2019 gown that was not only perfect for the premise of the rom-com, but also very Valentine’s Day-esque. Aside from the ruffles, the drama and the colour, I love how this shows just how far Miley has come style wise. That’s not to say I didn’t enjoy some of her crazy moments, because I did. I just appreciate the that’s she knew when to close that chapter and move on from it. The same can’t be said for some of her peers.